The following software items are pre-requisites for the Multichannel Phonebar. If not already installed, the Phonebar installer will attempt to download and install these items before allowing Phonebar installation: If the user PC is not able to connect to the internet, the pre-requisites must be manually pre-installed. The necessary files can be download from Mircrosoft (http://download.microsoft.com). Ensure that you download the full package for each rather then just the initial installer setup package. Press the Windows key Windows on your keyboard, type "Windows Features", and press Enter. The Turn Windows features on or off dialog box appears. 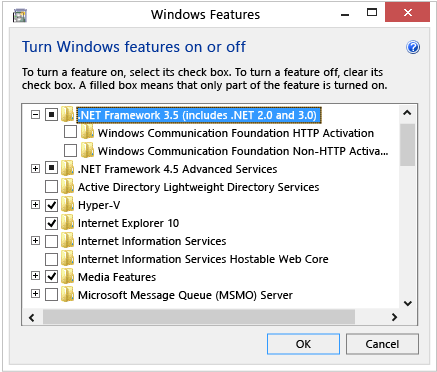 You don't need to select the child items for Windows Communication Foundation (WCF) HTTP Activation and Windows Communication Foundation (WCF) Non-HTTP Activation unless you're a developer or server administrator who requires this functionality. The following are the minimum and recommended requirements for Multichannel Phonebar. Minimum: Pentium 4 2.4 GHz or equivalent. Optimal: Intel Core 2 Duo or equivalent. The Motion Phonebar is available only for Windows. If you have other OS you can use external SIP phones and log into the XCALLY Motion Agent web interface. Remember you will need at least ALL the following open ports to/from your XCALLY Motion server and your agent phone bar. Please look also at the CentOS iptables rules and modify those in the file: /etc/sysconfig/iptables adding new IP addresses where and when you need. The command service iptables restart will apply the new rules you have modified.